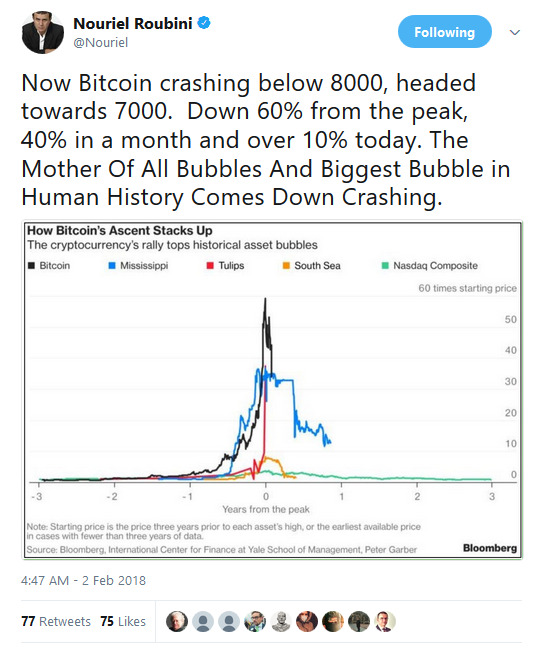 Nouriel Roubini, the economist and chairman of Roubini Macro Associates, says “The Mother Of All Bubbles” is crashing. He’s talking about bitcoin, which has fallen more than $US2,000 in two days, to below $US8,000 early Friday. The cryptocurrency markets were awash in a sea of red during early trading Friday – and one economist says we are in the middle of a major crypto crash. Nouriel Roubini, the chairman of Roubini Macro Associates, on Twitter described bitcoin as “The Mother Of All Bubbles.” His tweet shows bitcoin’s historic run compared with those of others, such as the infamous tulip bulbs. Crypto’s terrible start to the year deepened Friday, according to data from Markets Insider. Most striking was bitcoin’s fall below $US8,000, marking a drop of more than $US2,000 in two days. Bitcoin’s dip below $US9,000 on Thursday seems to have spooked the market, with bitcoin losing 12% in Friday trading. Roubini, a noted bitcoin critic, told Bloomberg Radio’s Tom Keene that regulators had “fallen asleep at the wheel” when it comes to cryptocurrencies – specifically by not cracking down on initial coin offerings, a crypto twist on initial public offerings. ICOs have raised over $US4 billion and become a darling of some criminals looking to make a quick buck off mum-and-pop investors. Roubini also said regulators hadn’t done enough to address fraud and manipulation in the market for digital coins, pointing to Tether, a cryptocurrency company with a digital coin it says is fully backed by the dollar. Concerns about the status of Tether reached a fever pitch this week after Bloomberg reported that US regulators subpoenaed the company in December, Business Insider’s Oscar Williams-Grut noted. The cryptocurrency is central in the operation of many leading cryptocurrency exchanges, including Bitfinex, but many are sceptical that the company behind it holds the dollar reserves it claims. Roubini echoed this argument on Friday.